Italian composer of operas 'La Boheme' and 'Madama Butterfly.' He was considered second only to Giuseppe Verdi in his day. He pioneered the verismo style. He saw a performance of Verdi's "Aida" and abandoned plans to become a church organist, choosing instead to become an opera composer. His first opera "Le villi" was written in 1883. His plans to complete "Madama Butterfly" were impeded by a near-fatal car accident in which he was pinned underneath the car. He married Elvira Gemignani after her husband was murdered by one of his mistresses. 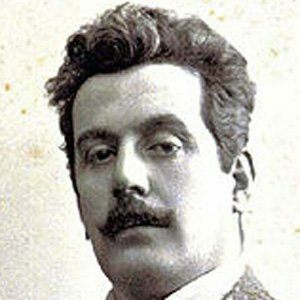 She, however, did not escape the turmoil of infidelity, as Puccini himself was a known womanizer. He was briefly acquainted with Benito Mussolini, but never personally joined the fascist party, even though they made him an honorary member without his blessing.